Lively colors energize the spirit and turn the monotony of everyday life into a festival of visual delight. 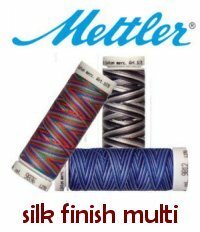 2-Ply Mettler Silk-Finish Multi offers exactly this. Mettler Silk-Finish Multi also proves its strength in demanding applications. This high-quality, lint-free embroidery thread made of double mercerized, long-staple Egyptian cotton is extremely soft and very easy to work with, making it ideal for colorful motifs on both fine and moderate weight materials. This multi-color thread dazzles with its natural shine and harmonizes beautifully with many solid colors of Mettler Silk-Finish.